YouTube is known for a lot of things: some good, some questionable and some downright horrible. But I have found that one of its most important features is rarely mentioned. This is the fact that it is a massive hub of knowledge, ranging from the basic to the extraordinary. In fact, Jordan Peterson, the Canadian clinical psychologist and public intellectual calls YouTube the new “Gutenberg Revolution.” This is because with YouTube, and to some extent podcasts, anyone anywhere can now pick up a microphone or launch a channel and disseminate their idea to an unlimited amount of people for an unlimited number of hours. Peterson’s biblical lectures have been seen by millions of people, more than 12 times the entire student body at the University of Toronto where he teaches. My favorite channel/podcast, The Joe Rogan Experience, routinely has interviews that are two to three hours long and are downloaded by 30 million people each month (and that was in 2016). That’s more than ten times the viewership for the highest rated cable news show. I could go on and on about the virtues of YouTube & Podcasts, but fortunately, this article isn’t about that. It’s about something just slightly more interesting. Last week on an easy-going day (by which I mean a day I was ignoring my responsibilities), I decided to listen to a random podcast on the JRE. Three hours later, I was enthralled by Asteroids and the role they have and could play in our civilization. Defined by NASA as “rocky, airless worlds that orbit our sun,” asteroids range in size from a few feet to a few miles. While their sizes are important, what’s more significant is what happens when these minor planets collide with ours. When asteroids come in contact with our atmosphere, one of two things happen depending on its size. If it’s small, it vaporizes, releasing streaks of light. 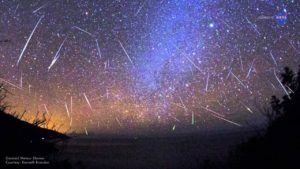 This is what is known as a meteor shower/shooting star. It is a beautiful sight. However, if it’s bigger, the result is not as beautiful. Bigger asteroids are more likely to survive the trip through the earths atmosphere and they either explode in the sky above the ground or explode on contact with the ground. The most notorious of these impact events is the one that wiped out the dinosaurs 65 million years ago. That asteroid was roughly six miles across and the impact resulted in the death of 3/4ths of all the plant and animal species of the time. In addition to that, the collision radically altered the climate, throwing between 325 gigatons of sulfur and 425 gigatons of carbon dioxide up into the atmosphere, more than 10 times global human emissions of carbon dioxide in 2014. This massive layer blocked out the sunlight, reflected the sun and plunged the climate into sub-freezing temperatures for years after. 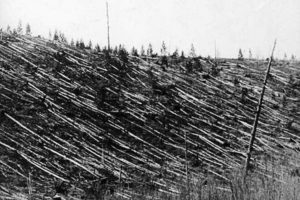 In the modern era, we have the Tunguska impact where in 1908 a large meteorite exploded several miles over Siberia. According to NASA science, anyone up to forty miles from ground zero would have been blown back by the force and the heat would be so intense it would feel like their clothing was on fire. Anyone closer would most definitely have been killed as the explosion is estimated to have flattened more than 80 million trees across 820 square miles. The energy released from the impact was estimated to be equivalent to about 185 Hiroshima bombs. A good analogy is that it was like a point-blank shot from a cosmic shotgun. Asteroids may have also played a more important role than causing mass extinction events and radically altering the climate. 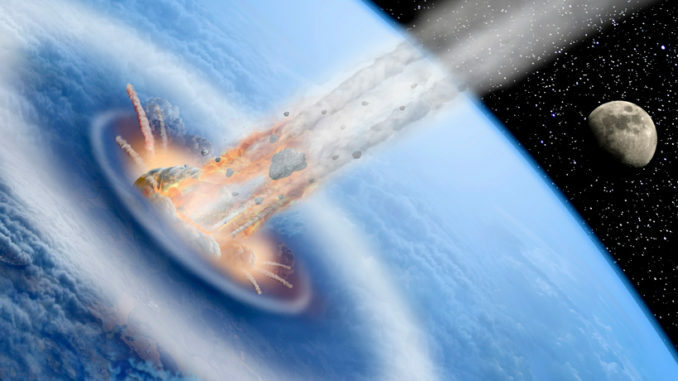 There is another impact event that is the source of a hotly contested debate and this is the “Younger Dryas impact hypothesis.” This hypothesis posits that the abrupt interruption of earth’s warming phase (the earth goes through periods of cooling and warming based on its tilt toward the sun) was caused by an extraterrestrial impact. This impact launched the younger dryas cooling period from 12,800 to 11,500, an era which is significant because it is thought that it sparked the Neolithic revolution. There is an abundance of evidence for and against this hypothesis. One thing a lot of mono and polytheistic religions have in common is that God (or gods) are often depicted as residing in the sky. It’s a recurring theme that’s easy to gloss over, but in my recent fascination with the topic of asteroids, I’ve realized that perhaps it’s because the sky is the most accurate representation of infinity we as mankind have. Anyone who’s ever glanced up at the night sky in an area without light pollution will understand what I’m talking about. It’s why astronauts who’ve been in space report having awakened spiritual experiences. We live in an era of self-driving cars, pocket sized computers and a host of other technological marvels. It’s easy for us to forget that despite our remarkable advancements, we are just a simple, minuscule planet in the infinitesimal ecosystem of the cosmic universe, and all it would take is a rock several miles wide from space to wipe us all out.